I, like many other expats in teaching in Korea, am in my early 20’s and arrived shortly after graduating from university. I thought coming here that my days of partying and staying out all night had ended. Prior to leaving I did a lot of research on the cultural sites and history of the country, but I never thought to look into the social drinking culture in Korea. I thought to myself, “It’s a conservative country, surely there will be bars but that lifestyle won’t be the focus.” Boy, was I ever surprised when I arrived. Koreans consume more alcohol per capita than Russian, American and British citizens combined. The average citizen drinking more alcohol per week than any other country in the world. The truth to that statistic is definitely apparent once you arrive. Drinking has become a very cultured form of social life. There are a lot of customs when it comes to drinking and isn’t solely for fun. The largest difference between the drinking cultures here in comparison to Western countries is that in Korea people drink to give and receive respect. This custom originates from Korea’s Confucian era when people drank to show respect to their elders. This custom holds true today and it is still a huge compliment to be invited to drink with an elder or superior co-worker. Most co-workers and companies have nights out quite often to bond and strengthen friendships. When out drinking with an elder or superior there are many drinking etiquette rules you should follow. Hierarchy of age is pretty important in Korea so if you’re the youngest, get ready to be pouring the drinks most of the night, however you must never pour your own drink, as it shows indulgence. How you hold and consume the alcohol is also important. You must receive your glass with both hands as a symbol of respect for their generosity – this custom is also true to receiving anything from an elder or superior member of society. You must turn away from the other guests as you drink, and it’s impolite to leave any guests' glass empty for a long period of time. The other important rule is that you cannot refuse a drink from a superior. This is a big no-no in Korea and is often the cause of over consumption. It is also impolite to refuse any gift in Korea as it symbolizes refusing generosity. Although all these rules are still in use in Korea, any expat isn’t expected to know or follow them but it is still fun to try one of the many nights you’ll find yourself out. Another thing I found surprising about Korean drinking culture is that alcohol is everywhere! There are no public drinking laws! You can drink anywhere, sidewalks, parks, beaches, and even convenience stores have set up picnic benches to allow their customers a place to sit and chat while drinking. I believe the only public place not permitted to drink is a school ground. Alcohol is sold at any convenience store, grocery store, restaurant, or a po-jang- macha, which is literally just an outdoor drinking tent. With this social drinking knowledge, what should you drink? Korea offers many alcoholic choices similar to those in Western countries but they also are known for a couple of drinks native to their country. The first and most common form of alcohol in Korea is soju. It is native to Korea and the most popular drink of choice here. It is made from rice and is clear and colorless. It is about 20% alcohol and tastes similar to vodka. 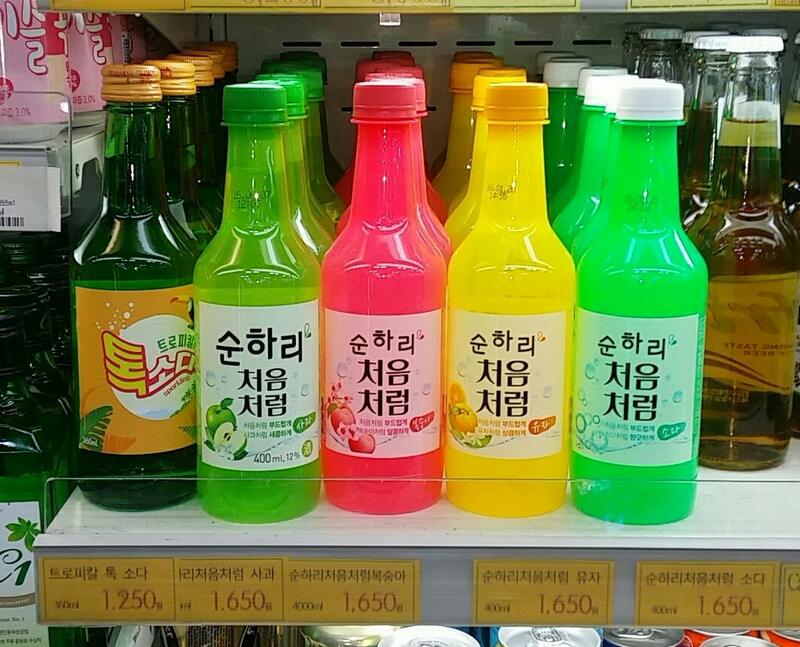 Recently, Korea has begun introducing flavored soju so now you’ll have a wider range of choices when it comes to purchasing it. Available is citrus, orange, pomegranate, grapefruit, blueberry, apple, pineapple, peach, and a new bubbly soju that tastes similar to champagne. A bottle of soju costs between ₩1200-₩1500 (under $2) which is possibly the most astonishing thing about Korean drinking culture, its cheapness. 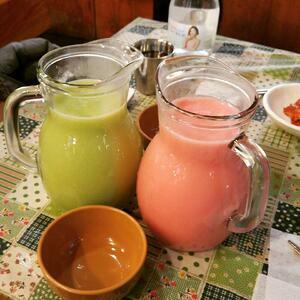 Another popular drink in Korea is makkoli. It is also made from rice, but goes through a fermentation process so it’s often called rice wine. It is typically between 6-8% alcohol and is a milky, off-white color. Also in recent years people have begun making flavored makkoli as well. I myself have tried honey, blueberry, kiwi, banana and strawberry flavor. A bottle sells between ₩2000-₩4000 ($3-5) Makkoli is hands down my favorite alcoholic drink in Korea, and flavors are great even when mixed together. It is delicious and a must try. The final popular drink in Korea is beer. Many restaurants sell only chicken and beer as it is a hugely popular combination. Beer in Korea is called hof and there are many native Korean beers to try from. 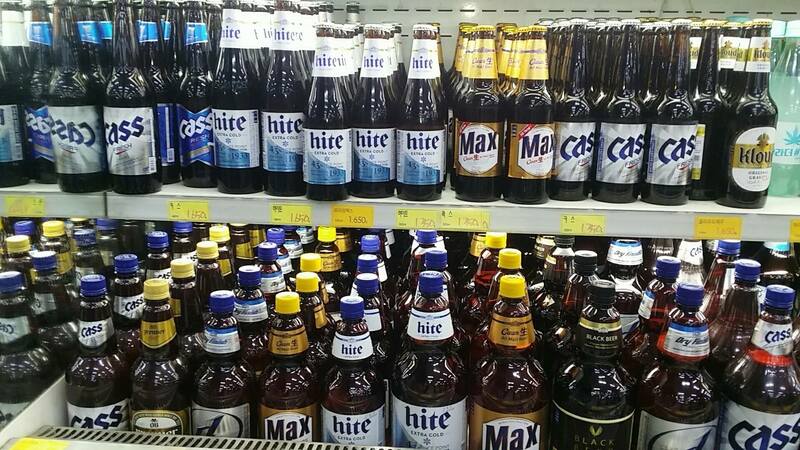 Cass, Max, Hite and OB are the biggest brands. Most native brands you’ll find are lagers, although many of them are brewed from rice instead of malted barley, which is a typical Western style. The alcohol percentage ranges between 3-5% and you can grab a 2L bottle from the convenience store for under $5. Many make a drink something called somek, which is a mixture of soju and beer together. Something I was hesitant to try but is actually really good. Craft breweries have begun getting popular, especially in the larger cities in Korea. A popular one in Busan is called Galmegi Brewing Company and serves many craft beers, seasonal flavors and offers a range of styles. They already have four locations running in Busan and is very popular amongst the expat community. Although the drinking culture is huge in Korea, the country is called the Land of the Morning Calm, and as a result it does not become the only culture you experience. It is just one of the many unique social aspects of the Korean lifestyle that is fascinating to explore as an expat. I hope you enjoyed learning about the Korea drinking culture and its customs. Cheers!